This article reviews the dermatologic manifestations of Mycobacterium avium-intracellulare (MAI, or MAC) infection. Although the prevalence of MAI infection has increased following the epidemic of acquired immunodeficiency syndrome (AIDS), MAI infection remains a rare cause of skin disease. However, MAI has been found to cause cutaneous disease in individuals with immunocompetence and immunosuppression. Disseminated disease (DMAI) most commonly occurs in individuals who are immunosuppressed, and hematogenous seeding of the skin may result in a wide variety of skin lesions, including nodules and abscesses, panniculitis,  folliculitis, and acute disease with hemorrhagic pustules. See the image below. 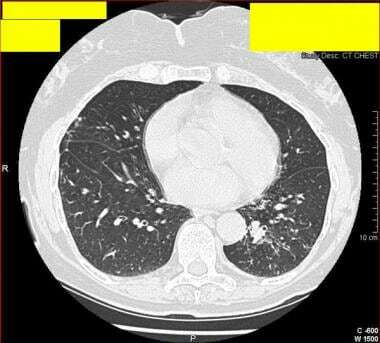 CT thorax scan of a 77-year-old woman who presented with chronic cough and sputum production, without a history of underlying preexisting lung disease. Sputum culture grew Mycobacterium avium complex. The diagnosis was Lady Windermere syndrome. MAI is the most common cause of pediatric cervical adenitis. Skin involvement in this setting is not uncommon and includes sinus track and abscess formation. Cervical adenitis rarely involves deeper structures, but it may result in extensive superficial destruction with cosmetic deformity. Primary cutaneous MAI infection is rare, with 12 cases reported in the literature prior to 1997. This condition has been reported in all age groups; although most case reports of primary cutaneous MAI infection have been in individuals aged 2-10 years, adult cases have also been described. A review of 8 cases of cutaneous MAI infection occurring secondary to disseminated disease found a median patient age of 22.2 years, with a range of 2-28 years. The degree to which skin involvement occurs as a sequela of cervical adenitis has not been well studied; however, the literature suggests that the risk of skin involvement increases with advanced disease. Cervical adenitis most commonly affects children. One chart review series of 47 children with cervical adenitis revealed a median age of 3 years when MAI infection was diagnosed by doctors. It is important to consider cutaneous infection with Mycobacterium avium-intracellulare (MAI, or MAC) in patients with antibiotic-resistant cellulitis, in those with nonhealing nodules and ulcers, and in patients who are immunosuppressed with evidence of disseminated MAI (DMAI) infection. Patients with MAI cervical adenitis may present with an indolent course of a unilaterally expanding mass in the neck, such as enlarged submandibular or submaxillary nodes. Cutaneous MAI infection should be suspected when an individual who is immunocompromised presents with obscure skin lesions. Additional symptoms, including fatigue, fever, diarrhea, weight loss, back or bone pain, shortness of breath, and/or cough may suggest disseminated disease. Primary cutaneous MAI infection is most often the result of traumatic inoculation, although a specific history of trauma is generally absent. Patients may describe the development of a single nodule or multiple nodules progressing over time into ulcerative lesions with or without serosanguineous exudates. Painful subcutaneous nodules and ulcers that occur on the extremities and the trunk may be noted. Lesions may be present in multiple stages of development, and nodules have been described as both flesh colored and purple-red. MAI can be associated with osteomyelitis. Primary nontraumatic MAI complex osteomyelitis of the distal phalanx has occurred. Multifocal osteomyelitis caused by nontuberculous mycobacteria in patients with a genetic defect of the interferon-gamma receptor has also been noted. Primary cutaneous Mycobacterium avium-intracellulare (MAI, or MAC) infection is rare, but it does not necessarily mandate a workup for immunosuppression. Biopsy should be performed for suspected dermatologic manifestations of MAI infection. Tissue samples of cutaneous lesions may be obtained for histopathologic evidence of mycobacterial infection, and staining with Ziehl-Neelsen stain may reveal acid-fast bacilli (AFB). Cultures of cutaneous lesions should be performed, and polymerase chain reaction (PCR) studies of tissue may yield organism identification in 24 hours. A spectrum of histologic findings is present in skin infection with Mycobacterium avium-intracellulare (MAI, or MAC). This is not surprising, because tissue pathology varies with the stage of the disease and the host's immune status. Granulomas are often present in tissue infected with MAI. Tuberculid, palisading, and sarcoidlike granulomas can be found in the context of a diffuse infiltrate of foamy histiocytic cells. Other nonspecific findings include panniculitis, chronic inflammation, cutaneous abscesses, necrotizing folliculitis, and suppurative granulomas. Patients hospitalized with Mycobacterium avium-intracellulare (MAI, or MAC) disease require inpatient care. However, primary cutaneous MAI infection and cervical adenitis may be treated in an outpatient setting if patients are medically compliant. A standard chemotherapy regimen has not been established for MAI infection because of significant resistance to antimycobacterial drugs. MAI is usually resistant to single-drug therapy and must be treated with multiple antitubercular medications. Sparfloxacin has good antimicrobial activity against several acid-fast bacteria (AFB) and is expected to be an effective drug for treating mycobacteriosis. In cases of cervical adenitis and primary cutaneous MAI infection, follow-up care is required to assess for toxicity due to therapeutic agents and to monitor patients for possible disease recurrence or surgical complications. All cases of cervical adenitis must be referred to a surgeon. The relative infrequency of this condition has precluded clinical trials; therefore, treatment schedules are derived from anecdotal evidence. Macrolides should be used in combination with rifamycin or ethambutol. Combination therapy with clarithromycin, ethambutol, and rifamycin has also been used. For adult patients, streptomycin (1 g intramuscularly [IM] daily for 3 mo), isoniazid (300 mg/d), and rifampicin (600 mg/d for 9 mo) have been used as treatment. Primary cutaneous involvement of Mycobacterium avium-intracellulare (MAI) does not usually result in systemic disease and most often occurs in otherwise healthy individuals; therefore, the prognosis is favorable, because treatment is generally curative. The relationship between cutaneous lesions and mortality in disseminated MAI (DMAI) infection is unknown, and controversy remains regarding the impact of disseminated MAI (DMAI) infection on life expectancy in patients with acquired immunodeficiency syndrome (AIDS). Nonetheless, untreated DMAI infection in this population (patients with AIDS) is clearly associated with an increased mortality rate. Primary cutaneous MAI infection and atypical Mycobacterium -induced cervical adenitis are responsive to combined surgical and medical treatment. However, cervical adenitis may cause local destruction of superficial structures and may result in significant cosmetic and functional impairment without treatment. Dissemination beyond the primary site is rare. Nonetheless, the proximity to the trachea and the oropharynx may result in airway compromise and should be considered when evaluating patients with cervical adenitis. What are the dermatologic manifestations of Mycobacterium avium-intracellulare (MAI) infection? What is the prevalence of dermatologic manifestations of Mycobacterium avium-intracellulare (MAI) infection? Which clinical history findings are characteristic of Mycobacterium avium-intracellulare (MAI) infection? What is the role of biopsy in the workup of suspected dermatologic manifestations of Mycobacterium avium-intracellulare (MAI) infection? Which histologic findings are characteristic of Mycobacterium avium-intracellulare (MAI) infection? How are the dermatologic manifestation of Mycobacterium avium-intracellulare (MAI) infection treated? How is cervical adenitis caused by Mycobacterium avium-intracellulare (MAI) infection treated? How is primary cutaneous Mycobacterium avium-intracellulare (MAI) infection treated? What is the prognosis of dermatologic manifestations of Mycobacterium avium-intracellulare (MAI) infection? Kullavanijaya P, Sirimachan S, Surarak S. Primary cutaneous infection with Mycobacterium avium intracellulare complex resembling lupus vulgaris. Br J Dermatol. 1997 Feb. 136(2):264-6. [Medline]. Sanderson TL, Moskowitz L, Hensley GT, Cleary TJ, Penneys N. Disseminated Mycobacterium avium-intracellulare infection appearing as a panniculitis. Arch Pathol Lab Med. 1982 Mar. 106(3):112-4. [Medline]. Edeer Karaca N, Boisson-Dupuis S, Aksu G, et al. Granulomatous skin lesions, severe scrotal and lower limb edema due to mycobacterial infections in a child with complete IFN-? receptor-1 deficiency. Immunotherapy. 2012 Nov. 4(11):1121-7. [Medline]. [Guideline] Siberry GK, Abzug MJ, Nachman S, Brady MT, Dominguez KL, Handelsman E, et al. Guidelines for the prevention and treatment of opportunistic infections in HIV-exposed and HIV-infected children: recommendations from the National Institutes of Health, Centers for Disease Control and Prevention, the HIV Medicine Association of the Infectious Diseases Society of America, the Pediatric Infectious Diseases Society, and the American Academy of Pediatrics. Pediatr Infect Dis J. 2013 Nov. 32 Suppl 2:i-KK4. [Medline]. [Full Text]. Chen HY, Chen CY, Huang CT, et al. Skin and soft-tissue infection caused by non-tuberculous mycobacteria in Taiwan, 1997-2008. Epidemiol Infect. 2010 Jul 2. 1-9. [Medline]. Kayal JD, McCall CO. Sporotrichoid cutaneous Mycobacterium avium complex infection. J Am Acad Dermatol. 2002 Nov. 47(5 Suppl):S249-50. [Medline]. Walsh TL, Baca V, Stalling SS, Natalie AA, Veldkamp PJ. Mycobacterium avium-intracellulare pulmonary infection complicated by cutaneous leukocytoclastic vasculitis in a woman with anorexia nervosa. Infection. 2014 Jun. 42(3):559-63. [Medline]. Boyd AS, Robbins J. Cutaneous Mycobacterium avium intracellulare infection in an HIV+ patient mimicking histoid leprosy. Am J Dermatopathol. 2005 Feb. 27(1):39-41. [Medline]. Perrin C. A patient with acquired immunodeficiency syndrome (AIDS) and a cutaneous Mycobacterium avium intracellulare infection mimicking histoid leprosy. Am J Dermatopathol. 2007 Aug. 29(4):422. [Medline]. Bachmeyer C, Thibaut M, Khuoy L, Danne O, Blum L. Subcutaneous and muscular abscesses due to Mycobacterium avium intracellulare in a patient with AIDS as a manifestation of immune restoration. Br J Dermatol. 2004 Feb. 150(2):397-8. [Medline]. Smith JM, Reid JE, Wilson ML. Resident Rounds. Part III. Cutaneous Mycobacterium avium-intracellulare resembling sarcoidosis. J Drugs Dermatol. 2013 Apr. 12(4):490-1. [Medline]. Rahmani M, Alroy J, Zoukhri D, Wein RO, Tischler AS. Mycobacterial pseudotumor of the skin. Virchows Arch. 2013 Dec. 463(6):843-6. [Medline]. Teraki Y, Ono S, Izaki S. Sweet's syndrome associated with Mycobacterium avium infection. Clin Exp Dermatol. 2008 Aug. 33(5):599-601. [Medline]. Yano S. Henoch-Schonlein purpura associated with pulmonary Mycobacterium avium-intracellulare complex. Intern Med. 2004 Sep. 43(9):843-5. [Medline]. Whitaker MC, Lucas GL. Primary nontraumatic Mycobacterium avium complex osteomyelitis of the distal phalanx. Am J Orthop (Belle Mead NJ). 2004 May. 33(5):248-9. [Medline]. Murdoch DM, McDonald JR. Mycobacterium avium-intracellulare cellulitis occurring with septic arthritis after joint injection: a case report. BMC Infect Dis. 2007 Feb 26. 7:9. [Medline]. Blair PW, Herrin D, Abaalkhail N, Fiser W. DRESS syndrome presenting after initiation of mycobacterium avium complex osteomyelitis treatment. BMJ Case Rep. 2015 Oct 5. 2015:[Medline]. Working S, Tyser A, Levy D. Mycobacterium avium complex olecranon bursitis resolves without antimicrobials or surgical intervention: A case report and review of the literature. IDCases. 2015. 2 (2):59-62. [Medline]. Faruqi S, Kastelik JA, McGivern DV. Diagnostic pitfall: Mycobacterium avium complex pulmonary infection and positive ANCA. Eur J Intern Med. 2008 May. 19(3):216-8. [Medline]. Carlos CA, Tang YW, Adler DJ, Kovarik CL. Mycobacterial infection identified with broad-range PCR amplification and suspension array identification. J Cutan Pathol. 2012 Aug. 39(8):795-7. [Medline]. Huang Z, Qiu C, Guan Y. 18F-FDG imaging of a rare cutaneous infection by Mycobacterium avium complex. Clin Nucl Med. 2014 Mar. 39(3):301-4. [Medline]. Franco-Paredes C, Marcos LA, Henao-Martínez AF, Rodríguez-Morales AJ, Villamil-Gómez WE, Gotuzzo E, et al. Cutaneous Mycobacterial Infections. Clin Microbiol Rev. 2018 Jan. 32 (1):32(1). [Medline]. Liou JH, Huang PY, Hung CC, Hsiao CH. Mycobacterial spindle cell pseudotumor of skin. J Formos Med Assoc. 2003 May. 102(5):342-5. [Medline]. Shiomi T, Yamamoto T, Manabe T. Mycobacterial spindle cell pseudotumor of the skin. J Cutan Pathol. 2007 Apr. 34(4):346-51. [Medline]. Salvana EM, Cooper GS, Salata RA. Mycobacterium other than tuberculosis (MOTT) infection: an emerging disease in infliximab-treated patients. J Infect. 2007 Dec. 55(6):484-7. [Medline]. Mukkada S, Metzger ML, Santiago T, Wolf J. Severe Progressive Mycobacterium avium Complex Infection Associated With Brentuximab Vedotin Therapy. J Pediatric Infect Dis Soc. 2018 Nov 12. [Medline]. Vuppalapati G, Turner A, La Rusca I, Schonauer F. Mycobacterium avium infection involving skin and soft tissue of the hand treated by radical debridement and reconstruction in addition to multidrug chemotherapy. J Hand Surg Br. 2006 Dec. 31(6):693-4. [Medline]. Ichiki Y, Hirose M, Akiyama T, Esaki C, Kitajima Y. Skin infection caused by Mycobacterium avium. Br J Dermatol. 1997 Feb. 136(2):260-3. [Medline]. The authors and editors of Medscape Reference gratefully acknowledge the contributions of previous authors Jessica M Allan, MD, and Nicole Restauri, MD, to the development and writing of the source article.